Now that the Financial Services and Markets Act 2000 has had a chance to bed itself down and the Financial Services Authority (FSA) is developing its new regulatory toolkit and modus operandi, financial regulation has moved on in interesting directions. This book takes a critical look at the principles and practices behind this regulation, as well as the theory that is involved. 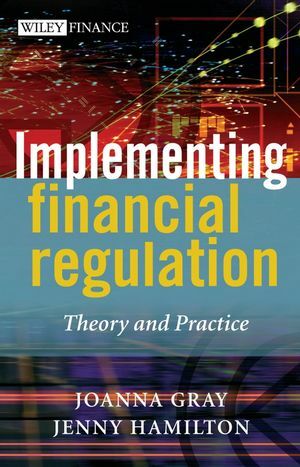 This book goes further than a description of the laws that are currently out there, by analysing the impact and implications of the new financial regulations, making it a ’must-read’ for law, finance and accounting practitioners. Coverage includes: Regulation and compliance; disclosure risk and regulation and stakeholders in financial regulation. JOANNA GRAY LL.B. (Newcastle), LL.M. (Yale) Reader in Financial Regulation, University of Newcastle upon Tyne and Solicitor (England and Wales) has also taught at the Universities of London, Dundee, and Strathclyde and qualified as a solicitor with a leading City of London practice for whom she subsequently worked as a consultant. In 2000 returned to practice full-time doing advisory work relating to financial regulation at a leading Edinburgh law firm. She taught the first UK undergraduate Law School course of its kind in 1986-1987 in financial services regulation at UCL (jointly with Dr Cento Veljanovski an economist). She has had extensive experience in training and consultancy work in financial services law and regulation both for law firms and for industry and has published widely in academic and industry journals on financial services law and company law. JENNY HAMILTON Professor in Law, University of Strathclyde, UK has taught at the University of Strathclyde for the past nine years, primarily in the field of commercial law, consumer law and financial services regulation. Qualified as a barrister and solicitor in Australia she practiced law and taught in Australia before moving to Scotland in the mid 1980s where she has since taught. She is also a visiting lecturer on the LLM program at Monash University, Australia. She was formerly a Council member of the Scottish Consumer Council (1999–2003) and is currently the Council Moderator of a co-operative lending society based in the north of England that aims to reduce poverty in the world, by providing fair and just financial services. 2. Aligning risk and regulation: FSA’s risk-based operating framework. 3. Regulation within the regulated firm: legislation and rules. 4. Senior management regulation: evidence and practice since N2. 5. The wider regulatory and legal context for senior management. 6. Regulation and the emergence of the financial citizen. 7. An illustrated critique of meta regulation and concluding comments.